Red Robin Solar are giving one lucky winner the opportunity to bling up their garden this summer with an enchanting set of Blingstring Solar Fairy Lights. 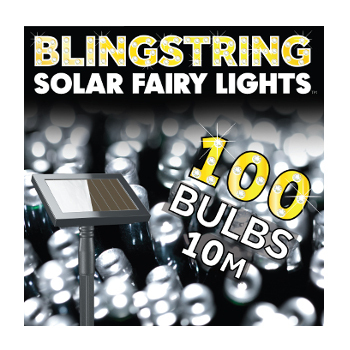 The Blingstring Solar Fairy Lights are one of the bestselling solar fairy light brands in the UK. The lights come with an amorphous solar panel designed to give improved performance in dull weather. The back of the solar panel has been designed to enhance the waterproofing. Incredibly easy to install and free to run you will not be disappointed with your Blingstring Solar Fairy Lights. This particular version has 100 white LEDs. To be in with a chance of winning some Blingstring Solar Fairy Lights, all you have to do is follow tracyandmatt on Twitter and retweet the following tweet: “RT I want to win some Blingstring Solar Fairy Lights from @tracyandmatt and @redrobinsolar – You could too: http://wp.me/p3WUB6-fNO ” You can also click the retweet link below to save you copying and pasting the phrase. Your twitter name will be entered in to the draw. You’ll have to keep following us as we’ll notify winners via DM. Entry is open until midnight on the 15th May 2016 and the winner will be picked at random on the 16th May. Will that be a lucky day for you?